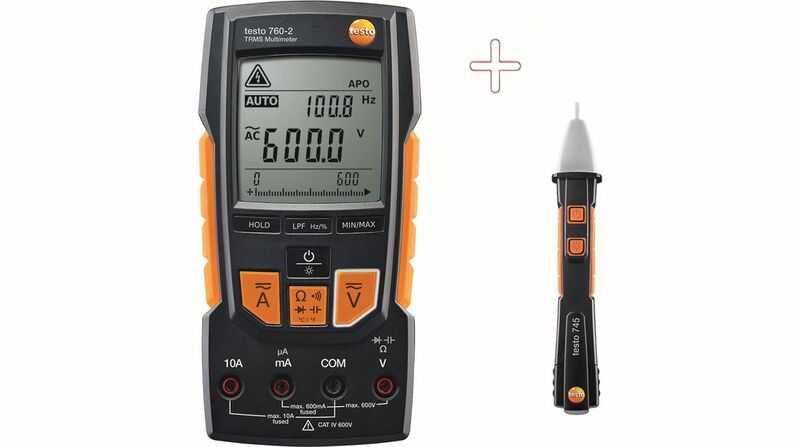 TESTO T760-2 MULTIMETER WITH T745 gekopieerd! Geef zoveel mogelijk details met betrekking tot item 301-10-033, Multimeter digital with Non-contact Voltage Tester TRMS AC+DC 600 VAC. The testo 745 non-contact voltage (NCV) tester quickly checks for the presence of voltage in AC powered systems. It can be safely used up to 1000 V AC. When AC voltage is detected, the testo 745 gives an indication, by flashing its red LED tip, and buzzing its internal audible buzzer. You can easily determine the hot and neutral legs of an outlet, without the time consuming and risky removal of the outlet from the outlet box.